Home » News » Every 5th October, in Portugal we remember. Lest we forget. Every 5th October, in Portugal we remember. Lest we forget. 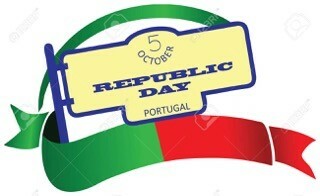 In Portugal, every year, on 5th October, since 1910, the proclamation of the first Portuguese Republic has been celebrated. Speeches are made, parades are organised in Belem, tourists take photos and selfies and with a bright autumn sun shining, people enjoy the annual public-holiday. In Portugal, on 5th October 1910, the centuries-old Portuguese Monarchy came to a bloodless end. At least for King Manuel II and his mother Queen Amelia, the sole survivors of the brutal attack on the Royal Family that took place two years earlier in the Terreiro do Paço that left the then King, Carlos I and the Prince Royal, Luis Felipe, dead. Both were killed on the spot, whereas Queen Amelia and the younger son, Manuel II, were merely wounded. Investigations to find the perpetrators of the attack - members of the Carbonaria, the armed wing of the Freemasons - took two years to complete. During those two years of social upheaval, demonstrations were brutally repressed and army and naval mutinies and rebellions were put down with great violence amidst ongoing political strife. One of the consequences of the Declaration of the Republic on the 5th October, 1910 was the summary dissolution of the Monasteries and Convents, including those of foreign orders. The period photo below depicts Portuguese soldiers and sailors evicting the Jesuits from the 'Convento das Inglesinhas' in the Bairro de Madragoa, which is so called as it used to house the English nuns of the Order of St Bridget until their similar expulsion in 1834. The building still belongs to the State and is now a university (ISEG). In the early 1900s, 69% of Portugal’s five million population were illiterate and over 60% were working class, living outside the main cities. A litre of milk cost 18% of the daily salary of the time, 1kg of rice cost 40%, and 1kg of potatoes cost 20%. As the educated classes prospered, workers, farmers, fishermen struggled to survive, so support for a revolution led by the Republican Party made sense. Unfortunately chaos was to prevail for many more years. The sixteen years of the First Republic saw nine Presidents and 44 ministers take office and was a time of "continual anarchy, government corruption, rioting and pillage, assassinations, arbitrary imprisonment and religious persecution". Born on 11th November 1889 – being a young boy who had not been groomed to rule - King Manuel II's first act as Monarch after the assassination of his father and brother was to ask for the resignation of Prime Minister Joao Franco and to appoint a new government which he hoped would bring about more stability to Portugal. However, political mayhem and dire social conditions forced him to flee with his mother to England where he settled at Fulwell Lodge, Twickenham, just outside London. In exile, he continued to support efforts to restore the monarchy in Portugal by legal means, and continued to play a prominent role in the relationship between Portugal and the United Kingdom. During WWI, he threw himself into relief work and helped to establish several medical facilities, both in France and England. He married an Austrian princess, Augusta Victoria of Hohenzollern, in 1913, but they had no children and thus the main line of the Portuguese Royal family died out. King Manuel II died quite unexpectedly on July 2, 1932. His remains were returned to Lisbon on a British cruiser and were received in the Praça de Comércio – the very place where his father and brother were killed 24 years earlier. The procession traveled to the Monastery of São Vicente de Fora, where the King's remains rest in the Royal Pantheon of the House of Braganza. By some he was called O Patriota for his preoccupation with the national identity; or O Desventurado, because he lost his throne, or O Bibliofilo for his love of Portuguese literature. For others he was still, o Rei-Saudade, for those nostalgic about the lost Monarchy. 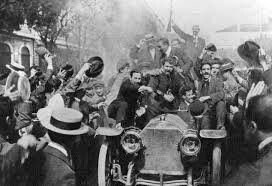 The first Portuguese Republic, as celebrated every year on 5th October in Portugal, spanned a complex 16 year period until 28 May 1926, when a coup d'état set up the Estado Novo regime of Antonio de Oliveira Salazar.